We do have vendors approved to accept WIC and Senior FMNP vouchers. Look for vendors with a sign displayed about WIC for those accepting the voucher. Registration for Vouchers will be June 25 at the market from 9:00 to 11:00 am or at the Whistle Stop starting June 13. 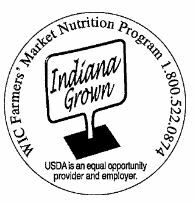 Participants who qualify will receive 4 – $5 FMNP checks that they may use only at Farmers’ Markets and farm stands that are authorized by the Indiana State Department of Health (ISDH) Farmers Market Nutrition Program (FMNP). Authorized markets and stands display an authorized vendor sign provided by the ISDH FMNP.